The Catholic sacraments are ceremonies, special occasions for experiencing God’s saving presence. Baptisms are scheduled at St. Aloysius during our regular Mass times (except during Lent). Since Baptism is a parish celebration warmly welcoming the infant/child into the faith community, we discourage requests for “private” baptisms. Please call the parish office at least 3 months prior to the birth of your child for further information. The Baptismal Preparation Program consists of a one night class typically held a week or two prior to the conferral of Baptism. This class provides the opportunity to truly reflect on the significance of the sacrament. Parents focus on ways faith can be incorporated into daily family life and review symbols that will be used during the ceremony. If parents have attended a class within the past five years in preparation for another child’s Baptism, they would not be expected to attend a class. Godparents are also encouraged to join us. Any interested parishioners are invited to help with the baptismal instruction class or to serve as assistants during the baptismal ceremony. Minimal training is required and is provided on an “as needed” basis. Confession at St. Aloysius is every Saturday in the chapel following the 8:15am Mass. The sacrament of Confession is offered weekly at St. Aloysius. It takes place each Saturday in the Chapel, directly following the 8:15am Mass. You can also set up a personal appointment for Confession with one of the priests. Our parish also participates in regional Reconciliation Services during Lent and Advent. Be sure to see the bulletin or parish calendar for dates, times, and locations of the regional services. Parishioners’ “First Reconciliation” typically is celebrated in 2nd grade. Students should either be enrolled in PREP or attend our Parish School. Adults needing to complete their First Reconciliation coordinate that with the RCIA team. 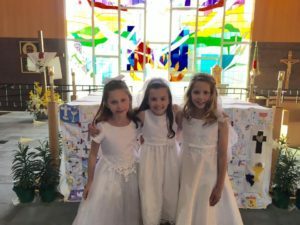 Parishioners’ “First Communion” typically is celebrated in 2nd grade. Students must either be enrolled in PREP or attend our Parish School. First Communion is typically celebrated in late April. Adults needing to receive their First Communion need to coordinate that with the RCIA team. For the St. Aloysius community, Confirmation typically happens in 8th grade. Mimicking the school calendar, the preparation process starts in the fall and the Sacrament will take place in the spring. Formal Catechesis, or classroom learning, happens either in Religion Class at school or on Sunday in PREP Class. There are other requirements (such as service projects, small christian community meetings, and a day of reflection) that happen outside of the classroom. The preparation process for Confirmation requires a commitment from the student as well as the entire family. To learn more information please contact Mandy Kumler, Coordinator of Youth Ministry. Weddings are typically scheduled on Friday evenings or Saturdays no later than 2:00pm. If you are newly engaged, congratulations! If you desire to be married at St. Aloysius, we encourage you to contact us as soon as possible to get the process of your marriage preparation started. The couple establishes that they are free to marry in the Church. At least three documents per person are needed to establish the freedom to marry: A statement from themselves, a proof of Baptism, and statement from a witness. The preferred witness is typically a parent. If the bride or groom is not baptized we must obtain permission from the archdiocese. Please note that we do not set a date for the wedding until this paperwork is complete. The couple participates in marriage formation. This can include the sponsor couple program held by the parish, or a retreat called Engaged Encounter, or a workshop sponsored by the archdiocese called Foundations for Marriage. Usually a marriage instrument called FOCCUS is given to the couple, which is an inventory that allows the couple to explore and converse on each other’s values, behaviors and experiences. Marriage formation is the most important part of marriage preparation and places the focus less on the wedding day and more on living out the Sacrament of Matrimony in daily life. The couple plans their wedding. This is assisted by our music minister and our wedding coordinator. Both ministers are experienced at planning weddings and the process is easy. We want you to have a beautiful, prayerful wedding. You may schedule your wedding in our church or chapel. Weddings are typically scheduled on Friday evenings or Saturdays no later than 2:00pm.